Some may have the belief that when a person is converted to the Lord and God Jesus Christ everything is forgive and all his problems are solved. This view seems to common in western churches. When a person is converted all his sins are indeed forgiven. But not all the consequences are done away with — not by a long way. Sometimes the consequences of one’s sins can carry over into his Christian life. For instance, if a person is promiscuous and contracts a STD it doesn’t mean he will be cured once he becomes a Christian. Yes, his sins are forgiven but he may still have to deal with the consequence of the sin of sexual immorality. This carry over is a lot of times exemplified in people who were involved in the occult, New Age, or any other grievous sin that opened the doors to the enemy to come into his life; once the person has repented and turned to Jesus Christ, the enemy will attack the person, even ruthlessly. The enemy doesn’t mind when a person is working for his kingdom but as soon as the person switches side to the Kingdom of Christ that is when the enemy gets riled up. Why? Because now born-again person has become a potential threat to the kingdom of darkness as the person has become a light of the world (Matt. 5:14) because of Christ. 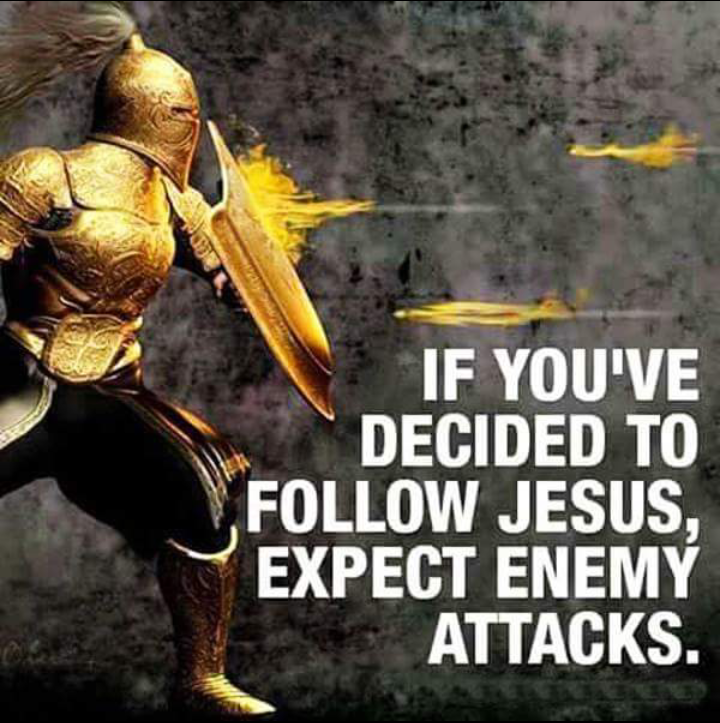 Don’t be surprised that after you have repented of your sins and truly submitted to the Lord that the enemy is attacking you left and right. The enemy desires to sift those who follow Jesus (Luke 22:31). The Apostle Paul was whipped, beaten, shipped wrecked, beaten, stoned, often hungered, and thirst during his ministry for the Lord (2 Corinthians 11:22-27). Certainly the enemy was opposing him (1 Thess. 2:18). In the letter to the Church in Smyrna, Jesus told them that satan was going to have some of them be imprisoned, and Jesus gave them encouragement promising them He will give them the crown of life if they stay faithful until death (Revelation 2:10). The Bible is clear that through many tribulation Christians enter the Kingdom of God (Acts 14:22). One may not suffer to the degree some in the early Church went through but there is no doubt satan today still comes after Christians like a devouring lion. But blessed are those who suffer for Jesus’ namesake (Matthew 5:11). “I did not grow up in a Christian home, so I really didn’t know anything about salvation till I was thirteen years of age. At that time, through the kindness of my aunt and uncle, I went to a Christian ranch in Colora, Maryland. Almost the first time I heard the gospel I came under conviction. I knew I was a sinner and needed Christ as my Savior. I trusted Him and He saved me! Oh how my life was changed! I just fell in love with Jesus Christ! He became my everything–my very life. I returned home to an unchristian environment and took a stand for the Lord. But before even a year went by, I started to backslide, and some of my joy in the Lord vanished. The following summer I went back to the ranch and there dedicated my life to Christ. But again, after a while I started to slip away from the Lord and hang around with the wrong people. Soon I was really in sin. The kids I went with knew of my stand for Christ. But to be accepted by them I quit witnessing. Before long I found myself actually disowning Christ and making light of what I had testified to. When I reached the age of fifteen, things began to go from bad to worse. The Beatles had become a world-famous singing group, and I honestly worshiped them. They took the place of God in my life. I would have literally sold myself to the devil to be with them. Time after time the Holy Spirit corrected me. But I rejected His calling every time. At seventeen I married a boy in my school who was not a Christian. My life became miserable, and I started to drink. At times I became so intoxicated that I would pass out. Under the influence of liquor I would make a fool of myself before men and curse my husband in front of them. I got to a point where I just couldn’t stand myself. One evening as I sat alone in my living room, the Lord began to speak to me again. I was twenty-two years old. I asked God to forgive me for living in awful sin, and I rededicated my life to Christ. Believe it or not, then began eighteen months of hell on earth for me. The very next morning I awoke terribly afraid. It seemed as f a great hand was around my heart, squeezing the very life out of me. I began to study the Bible and pray and tried desperately to have fellowship with the Lord. I also started going to a Bible preaching church. There I met some of the dearest Christian people in the world. Without their love and help I know I wouldn’t be alive today, for in the following months I had a terrifying urge to take my own life. I didn’t know it then, but during my years of sin and turning my back on God, I had been invaded by a demon. As long as I lived in sin and drunkenness, and did what the demon wanted, he didn’t bother me. But the moment I committed my life to Christ, the demon made my life one long torture session. I was constantly obsessed by terrible feelings of guilt. I know I must have run to the Lord a hundred times a day to ask forgiveness. Awful fear gripped me. It is impossible for me to convey to any human being the horror of demonic fear. It hounded me when I attempted to read the Scripture or pray. It confused my mind when I tried to think about the things of God. I could take this torture for only about five or six days. Then you know what I would do–rather be compelled to do? I would get drunk! Every time I got drunk or willfully sinned against the Lord, the pressure and the fear would stop! I did this two or three times a month. I would ask the Lord to forgive me. Then presto–the torture would start again. I yielded to God, cried out to Him, read every book I could lay hands on dealing with the victorious life. But the pressure, fear, and torment only got worse Things got so bad, in fact, that I began planning to commit suicide. The only thing that kept me from carrying out my plan was the thought that if I killed myself, my unsaved husband would go to hell. At this point my health gave way. I was on the verge of a mental and physical breakdown. At this desperate juncture I cried to the Lord, asking Him to show me what this awful thing was that stood between us. Just as clearly as if someone had spoken to me, this thought came to me. You have a demon! At this time I knew nothing about demons, except that I believed no believer, such as I was, could be possessed by one. I knew though that God had spoken. I became fearful, but the Lord wonderfully comforted me. My first impulse was to tell my dear friend Shirley ,who was a real student of the Bible. So I jumped in the car and drove to her house, telling her what had happened. She strongly disagreed with me, declaring that a Christian could not be demonized. She suggested that we both go over to the parsonage and talk this over with Mrs. D______, the pastor’s wife. This we did, and I told her the story. She and the pastor were aware of the torment I had been experiencing. Mrs. D_______ didn’t say anything except that we should pray. The three of us knelt in front of her sofa. Mrs. D______ laid her hand on my shoulder and began to pray softly. I started to call on the Lord. At that moment the pastor’s wife quietly commanded the evil spirit to come out of me. When she did this, I began to feel a lurching inside me. I began to gag as though I were about to vomit. I couldn’t catch my breath and had the sensation I was passing out, but actually it was the demon being expelled. I was totally drained of strength and had to lie down and rest awhile. I felt as though the weight of two worlds had been taken off my shoulders and a new life was opening up for me. Don’t ever be intimidated and lose trust in the Lord. Job was tried and tested by the enemy but he still never gave up. Let that be a lesson for all believers.